So this is the home stretch, or the last gasp, or however you want to see it. I'm not as caught up as I'd like to be (as if there's such a thing as degrees - I mean, you're behind or you aren't! ), but I'm still working, and I'm still struggling to scrape together the funds needed to get everything made and shipped. And of course the fun continues on other fronts (the household has a vehicle in the shop -- again -- for instance). So I should have another box of packages going out today or tomorrow, but there is still a whole 'nother big bin full that needs shipping, so this is another sale, good from now until my self-imposed deadline of Oct. 15 (see earlier posts for more info). And I really do think I'll get some finished shrines put up today or tomorrow too - let's hope. I have some previews of some related stuff in the previous post and below. 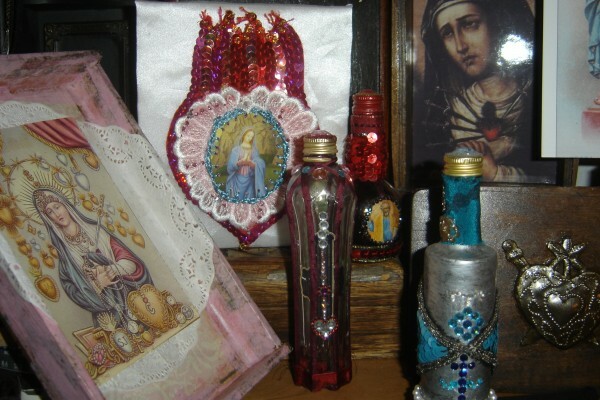 And every order that comes in between today (Oct. 9) and midnight on the 15th of Oct. will be eligible for a drawing to win one of these handmade sacramentals / altar items / talismans / whatever you want to call them, created for the saint, spirit, or loa of your choice and consecrated to that spirit or saint for you in your name. I will draw randomly from all eligible entries after the deadline on the 15th and I'll give away at least two of these - whether I do more will largely depend on whether I will be closing the shop for a while or not on that date. You can see an example of a fairly simple one that I made for a friend/client last week, and another, larger and more complex, piece in progress in the previous post. I suppose you could call these Karma-Zain-style detentes or badges or even package amulets in some cases. Generally these are double-sided, involve at least some sewing, and have cords or tabs for hanging or pinning. They usually range in size from palm-sized to desktop-sized, but we can talk about what you prefer if you are a winner, and about what in the world you might call these things if you care. But if you win, you can call them yours! I haven't quite finished any others because I'm focusing on getting orders made up and packaged still. But in the photo below you can see a collection of in-progress pieces I gathered to give you a taste of what will hopefully be done this weekend. The sequined piece on a white square background would be my largest and most elaborate "badge" / detente to date when finished, though most are more along the lines of the Ghuede / St. Gerard piece posted previously - the sequined one involves more detailed sewing than I really have time for right now, so there won't be anything else quite like it 'til I catch my breath, I'm afraid. You don't have to do anything special - just place an order. That will function as one entry into the drawing/giveaway. Two orders = two entries. And *every single order, no matter the order total, will have an available coupon code* - there is no minimum amount required to take a percentage off, though as usual lately, the more you spend the more you can save. Use code ides15 to take 15% off any order at all, regardless of cart total. Use code ides20 to take 20% off orders over $25 (before discount, excluding shipping). Use code ides25 to take 25% off orders over $60 (before discount, excluding shipping). Use code ides30 to take 30% off orders over $100 (before discount, excluding shipping). Use code ides35 to take 35% off orders over $160 (before discount, excluding shipping). Use code ides40 to take 40% off orders over $250 (before discount, excluding shipping). All good through midnight Oct. 15. For instructions on using coupon codes, see the applicable heading in the FAQ. Terms of Service re. shipping/handling and prep times apply. Read the FAQ here, including instructions on how to use coupon codes if you need them. Read the latest status updates, including matters affecting shipping, communication, etc. here. Your use of this site constitutes your acceptance of our Terms of Service, including your understanding of our posted shipping, handling, and turnaround times; guidelines for contacting us about a current order or service; and instructions for how to request a trace on a shipped item. 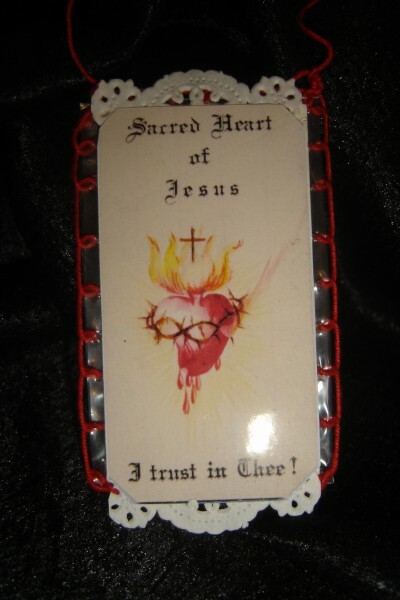 saints and sacramentals: relics, badges, scapulars, detentes, amulets, etc.